The eyes are windows to the soul, but your dog’s paws might be windows to his well-being. They provide a prominent place for health issues to reveal themselves to you and your vet. “Dogs feet are generally hardy, and minor cuts and abrasions usually heal quickly,” says Dr. Neil Marrinan of Old Lyme Veterinary Hospital in Old Lyme, Conn. But some injuries and conditions need your vet’s attention. Dr. Marrinan and Dr. Brett Levitzke, medical director of the Veterinary Emergency and Referral Group, Brooklyn, N.Y., describe some common paw problems and what pet parents can do about them. Yeast organisms (fungi) are normally found on your dog’s paws, but an underlying condition can cause them to multiply and cause problems. Licking excessively is a tell-tale sign of a yeast infection, Levitzke says, along with red nail beds, a reaction to salivary enzymes. Other symptoms include itching, redness and discharge. Yeast infections are often secondary to allergy, the doctors say, with the most likely culprit atopic dermatitis. However, environmental or food allergies also could be to blame. 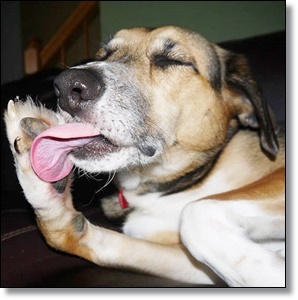 “The vast majority of dog paw problems are skin problems that are worse at the feet,” Marrinan says. Your vet can test the area to determine if yeast is the culprit and treat the infection with topical products, antifungal wipes and shampoos. If these treatments don’t do the trick, the underlying allergy may need to be addressed with antihistamines, steroids or anti-itch medications, Levitzke says. If a food allergy is suspected, elimination diets—where ingredients are taken out and then added back in—can help identify the trigger. Ringworm, a fungus found in soil or brought in from other animals, plants or from dog parks, also can infect your dog’s feet, and is not actually a worm or a ring. “It can look like a swollen toe or an abscess,” Marrinan says. Your vet will examine a sample of hair or skin under a microscope or send it to a lab for diagnosis. You can treat ringworm and prevent its spread with medicated bath products and a thorough cleaning of your dog’s environment. Ringworm is contagious and may spread to humans or other pets. Like yeast, bacterial organisms also are normally found on your dog’s paws, but a secondary health condition can cause them to multiply excessively. Symptoms include licking/biting, redness, swelling, pain/itching and abscess. Your vet can take a sample tissue from the affected area and evaluate it to determine if bacteria are the problem and, if so, prescribe either oral or topical antibiotics and antibacterial shampoos and soaks. Nails that are not trimmed properly or naturally worn down by walking outside can become painful ingrown toenails. Your vet can treat them with antibiotics and pain medication, but severely ingrown nails might have to be surgically resected, Levitzke says. A torn nail is common in the emergency room, Levitzke says, often after a tussle with another dog or a paw snags on carpeting or other material. When the entire nail has been pulled off, take your dog to the vet for immediate treatment to stop bleeding and manage pain. Antibiotics also might be prescribed. “If the nail has been incompletely removed, the treatment would be to remove the remaining bit,” Levitzke says. Hot asphalt can hurt your dog’s paws, and burns need to be treated immediately. Bandaging usually is required as a protective barrier on the skin or paw pad affected, Levitzke says. Antibiotics and pain medication are also typically indicated. Think of frostbite as a cold burn. As with burns from hot asphalt or pavement, these injuries need immediate veterinary attention. Treatment for frostbite includes bandaging, pain control and anti-infection measures. Avoid this injury by limiting your dog’s exposure to the elements. Prevention is the best way to avoid these injuries, Levitzke says. Put booties on your dog’s feet and use dog-safe salt. If your dog does get salt on his paws, wipe it off with a towel/paper towels. “We find that it tends to burn particularly when the paw pads with salt on them touch the snow, so try to avoid walking through salt and then snow, or wipe off feet between getting salt on them and walking through the snow,” he says. “One of the more common places we find ticks hiding is between the toes,” Levitzke says. “It is best to have a veterinary medical professional remove the tick.” Never take a lit or recently lit match to the tick. If you can’t get to the vet, use tweezers to grip the tick from the head and gently pull it out. The head must become detached along with the body for successful removal, he says. Pet supply stores also sell special tick-removal tools. Mites such as Demodex canis can present a frustrating problem and require a deep skin scrape or a biopsy to diagnose, Marrinan says. These mites can cause Demodicosis in which the mites that normally live in your dog’s hair follicles multiply and cause swelling, hair loss and scaling on your dog’s paws. Your vet will examine hair or skin samples under a microscope to accurately diagnose the condition, which is treated with medication, sometimes for several months. Dogs with lots of hair on their feet can catch gum, sticky asphalt, burrs and thorns in crevices, which can be hard to find and painful to remove. Prevent these problems by having the hair clipped by your groomer. Ingrown hairs manifest in short-haired dogs as tiny pimples and can lead to furunculosis, an infection deep in the hair follicle that can abscess and cause tissue damage. Dr. Neil Marrinan/Old Lyme Veterinary Hospital in Old Lyme, Conn.
Dr. Brett Levitzke, Medical Director/Veterinary Emergency and Referral Group, Brooklyn, N.Y.